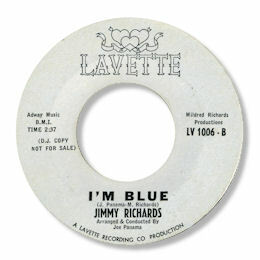 I would guess that Jimmy Richards came from the Big Apple since all his discs originated there. His first was a very nice doo-wop effort “I’m Blue” for Lavette but for deep soul fans it is his subsequent three A & M releases that have made him almost a cult figure. 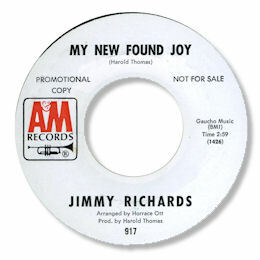 Prince Harold Thomas did a fine job recording his own song My New Found Joy but to most deep fans the definitive version is this one by Jimmy Richards. After some shimmering strings set the scene Richards comes in, murmuring to himself quietly before roaring out the hookline like a man possessed. The screams and howls are really thrilling – this is top class hard soul singing. I love the big horn section well to the front of the mix too. Look at the label and you’ll see that Thomas produced it – expertly so as well. A special tip of the hat to veteran arranger Horace Ott. His second release came from a session in Memphis with the AGP boys. I Won’t Be Responsible is taken at a slightly faster pace than his previous efforts and features a big arrangement from Charles Chalmers. But Jimmy is in wonderful voice and the chord changes are just perfect. Another outstanding track. And do I hear Bobby Womack on guitar in the background? Back in New York, Richards’ final 45 was an odd choice indeed. A straight forward version of Thomas A Dorsey’s immortal gospel great Peace In The Valley made a great showcase for his intense vocals, quavering with emotion, supported by a quality female chorus. Despite the fact the these 45 were really high class, sales were pretty poor. A & M were not the first place to look for this sort of material – could it be that the company’s distribution and promotion weren’t geared up for it? Note ~ The artist on Columbia is a white country/rockabilly singer.